Der Eigene. Ein Buch für Kunst und männliche Kultur. Vol. 6. Charlottenburg (Berlin), Brand und Linke Kunstverlag, 1906. Original gilt decorated cloth. (6), 192, (8) p. Printed on several types of paper in 3000 copies. Illustrated. 12 tipped-in pictures on heavy paper. 1st edition. Backstrip repaired. Corners a bit bumped. First page missing (containing the name of the owner and the number of the book). Otherwise in very good condition. * The world's first gay magazine (1896-1932) in its only affordable volume, the sixth. This was not published in monthly issues, but as a one year volume. 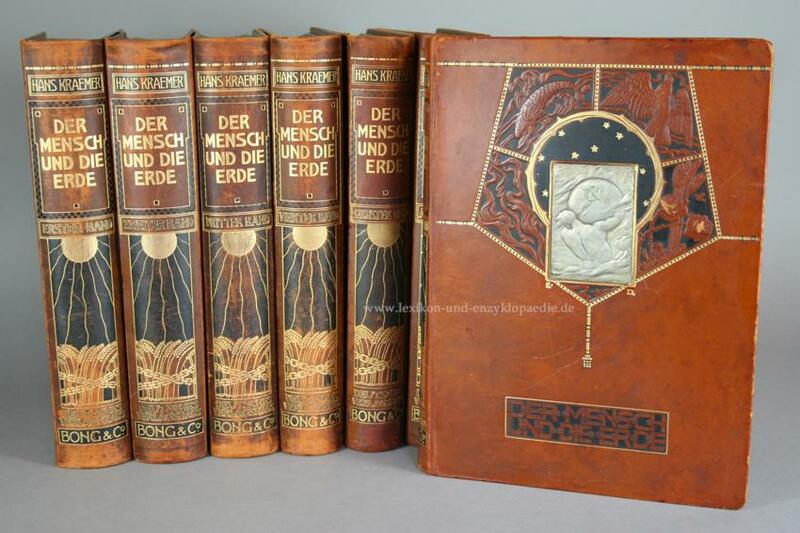 Paintings, drawings and photographs (some made by Adolf Brand himself, including a possible self portrait) are illustrating this beautiful Jugendstil book. 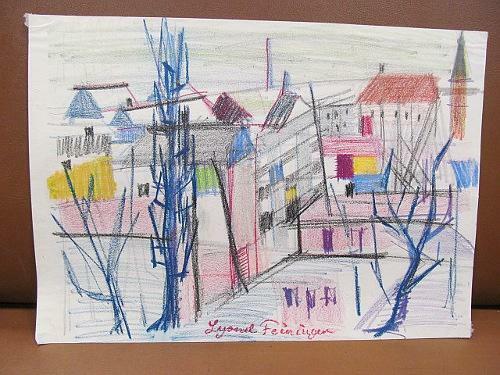 Farbzeichnung *Stadtansicht* ( wohl Gelmeroda ) in Farbkreide auf Papier. Am Unterrand mit Lyonel Feininger bezeichnet bzw. signiert. London: Frederick Warne and Co.,, 1906. Sextodecimo. Recent red half morocco, titles and decoration to spine gilt, raised bands, original pictorial boards and pictorial endpapers at front. With colour illustrations by the author. An excellent copy. First edition, first impression. Skitsebog. Håndtegnet skitsebog med talrige blyantstegninger med især ældre bygninger, tårne og arkitektur fra Frederiksberg, København og nærmeste Omegn. Von meiner Weltreise. 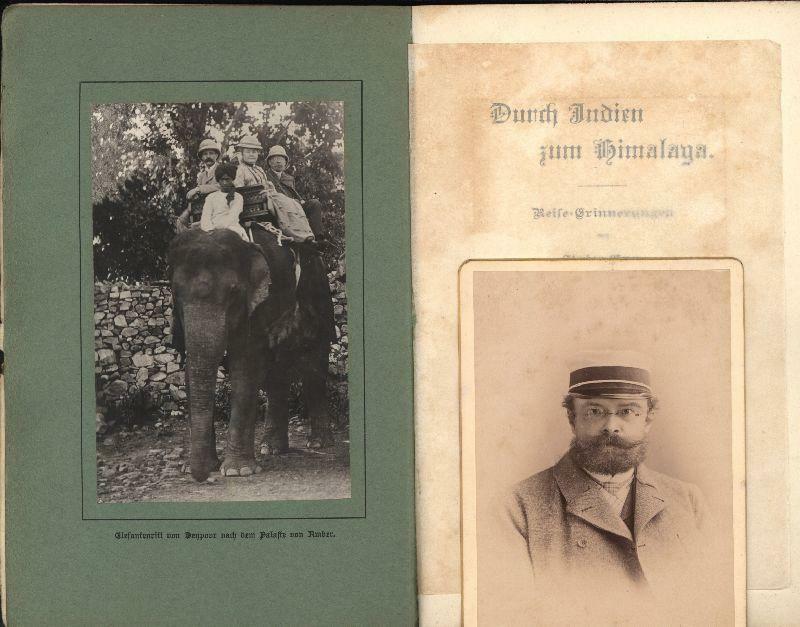 I. Durch Indien zum Himalaya. Reise=Erinnerungen. A Lodge in The Wilderness. London; William Blackwood and Sons. 1906. First edition. 8vo. 378pp. + 32pp ads dated 7/06. 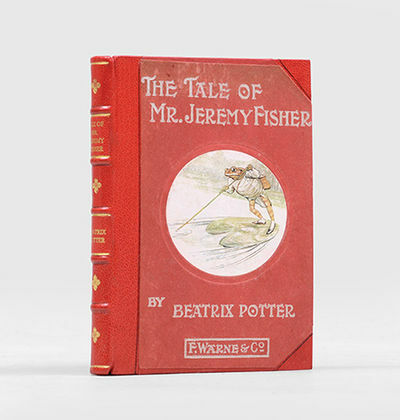 Bound in publisher's blue green cloth titled in gilt to spine and front board. Bumped to spine ends, light edgewear to extremities, a very good copy indeed. Burgundy endpapers, bookplate of Arthur R. Anderson to front pastedown. Internally clean with some offsetting to half title from bokplate. An examination of contemporary political and social situation couched by Buchan in the form of fiction. Rare. Leyden: Late E. J. Brill,, 1906. Translated by the late A. W. S. O'Sullivan. With an index by R. J. Wilkinson. 2 volumes, large octavo. Original dark green cloth, gilt lettered spines and front covers, ornamental panels on covers, drab grey endpapers. Half-tone frontispieces, half-tone and line illustrations throughout (two coloured folding maps of Acheh and plan of a dwelling house at the end on volume I). Booklabels of Dr A. O. Kouwenhoven. One or two very small white marks to back cover of volume II otherwise in exemplary condition. First edition in English of this important work on Aceh, "in the period of its greatest power [16th and 17th-centuries]... the most important Muhammadan state in Sumatra" (Brill, Encyclopaedia of Islam, VII p. 552). The author, Christiaan Snouck Hurgronje (1857-1936), was "a pioneer in the scientific study of Islam. While serving as a lecturer at the University of Leiden (1880?89), [he] visited Arabia (1884?85), stopping at Mecca. His classic work Mekka, 2 vol. (1888?89), reconstructs the history of the holy city and sheds light on the origins of Islam, early traditions and practices, and the first Islamic communities. The second volume, translated into English as Mekka in the Latter Part of the 19th Century (1931), contains many details of daily life in Islamic culture and deals with the Indonesian Muslim colony at Mecca. From 1890 to 1906 Snouck Hurgronje was professor of Arabic at Batavia, Java, and, as a government adviser, he originated and developed a Dutch colonial policy toward Islam that prevailed until the termination of Dutch rule in Indonesia in 1942. Though he was tolerant of Islamic religious life, his policy as a colonial official was to repress Islamic political agitation. His De AtjÃ¨hers, 2 vol. (1893?94; The Achenese), an ethnographic account of the people of northern Sumatra, became a standard reference work. Though Snouck Hurgronje remained a colonial adviser until 1933, he returned in 1906 to the Netherlands, where he was professor of Arabic and Islamic institutions at the University of Leiden until his death. He wrote extensively on a number of Islamic topics" (Encyclopaedia Britannica online). Hurgronje's study was produced against the backdrop of the long-running Aceh War (1873-1904), between the Netherlands and the forces of the Sultanate of Aceh, in which "Dutch forces became involved in a prolonged guerrilla war in the countryside. This war, however, drained the colonial treasury, and public opinion in the Netherlands became increasingly critical of the colonial administration. The administration later realised that their ignorance of the region had led them to commit serious errors. Christiaan Snouck Hurgronje, professor of Islamic studies at the University of Leyden (Leiden), was invited to undertake a thorough study of Aceh and published a book in 1893?94 on the Acehnese" (ibid). A particularly attractive set - bright and sharp-cornered - of this significant work. Biel 1906 - 32,5x25 cm. 48 S., IV S. Nachtrag, illustriert. Originalhalbleinwandband. Sehr seltener umfangreicher Warenkatalog in deutscher Sprache mit einem mehseitigen historischen und technischen Abriss. Der Einbanddeckel mit abweichendem Titel: "Omega Präszisions-Anker-Uhren". Text gedruckt in Rot. - Der historische Abriss mit Photos und Ansichten der Fabrikgebäude und der Ateliers. - Einband fleckig und Kanten stellenweise bestossen. Vorsatz gestempelt "Rud. Niklaus, Horlogerie-Bijouterie, Berne, Alleiniger Vertreter der Omega Uhr". THE STORY OF THE FIERCE BAD RABBIT. - Graesse III, p. 378; De Man & Höweler, Kunst op schrift 422-424 & 401, 408; for Mols: Linnig, Bibliothèques & Ex-libris d'amateurs Belges (1906), pp. 50-53. Ad 1: second edition of an important standard work, containing portraits and biographies of Dutch painters of the 17th century. It was intended as a continuation of Van Mander's book on Dutch painters, first published in 1604. The book starts with Desiderius Erasmus, omitted by Van Mander, and ends with painters born between 1635 and 1659, the death of the author preventing a further continuation.Ad 2: first and only early edition of Van Gool's continuation of Houbraken's, giving short biographies and descriptions of the works of Dutch painters from 1630 to 1725. It also includes a history of the drawing academy in the Hague.The whole set is interleaved and contains numerous notes by the Belgian art-lover, bibliophile and Rubens connoisseur François-Jean-Joseph Mols (1722-1790), adding many remarks, new stories, anecdotes and corrections. All volumes with his engraved bookplate. Mols owned a magnificent library and a fine art collection. Both works in very good condition, lacking the frontispiece of the second. Sides of the binding heavily rubbed. Uniformly bound set, with interesting annotations. [AUSTRALIAN POST] STRANG, Mrs Herbert (ed.). Storytime A Little Book for Little People. London: Henry Frowde, Hodder & Stoughton, circa, 1906. Small quarto, full colour frontispiece and one plate, 18 leaves, illustrated, printed in red and black; a pristine copy in the original stitch-sewn purple paper wrappers, colour plate tipped on to front cover; in the original mailing envelope of matching purple embossed card, envelope a little sunned, and missing original tie-back, with a second tipped on colour plate, addressed in cursive script, two 1d New South Wales stamps at top right, cancelled "Edgecliff" (date illegible). An attractive rarity: an almost unrecorded Rackham title, in pristine condition and still with its original decorated mailing envelope, sent from New South Wales to South Australia around 1910. The beautifully decorated envelope has been sent to "Master Mortie deLiut" (sp?) of Kingston, Lacepede Bay, South Australia. Two New South Wales "one penny" stamps are affixed, and have been cancelled at Edgecliff; although the date of cancellation is sadly indistinct, the stamps are certainly contemporaneous with the book.Herbert Strang was a pseudonym used by two English writers, George Herbert Ely and James L'Estrange, for their children's books. Perhaps better known for their books for boys, they used the name Mrs Herbert Strang for their stories written for girls, as here (see The Oxford Companion to Children's Literature).The frontispiece is by Arthur Rackham, and signed 1906 (hence the tentative date for the book). The image depicts a charming scene from the book, and is captioned "'I tell you,' Robert said, 'it's raining.'" This line is also the first sentence of the book, perhaps implying that the image was commissioned for this title (or, just as likely, that the first story was written to fit an existing plate). The book is well-illustrated throughout, and includes a second full-colour plate by the renowned illustrator Rosa C. Petherick, with the caption "The Cradle that Swings".This is a particularly rare work, with no listing on OCLC, and it is not recorded in Hudson's Bibliography of Rackham nor Gumuchian's Livres d'Enfance. SLOANE, William Milligan (1850-1928) [NAPOLEON]. New York: The Century Co., 1906. 4 volumes, quarto. Handsomely bound in quarter vellum over green buckram sides, top edges gilt, others untrimmed. Illustrated with 291 plates and maps, 79 in colour. Binding lightly aged only. A near fine set. The Princeton historian's monumental biography of the French Emperor. The Shakespeare Head Press Booklets, I-VI. Stratford-on-Avon, 1906. 4 x 5. 183) pages, each booklet numbered separately. They lack the outer brown paper wraps which had the title page reprinted on them. Period binding (à la Katherine Adams) by Samuel Feinstein of full wine morocco tooled with gilt rules and dots. Fine. The six parts are: no. 1. Ancient Carols, no. 2. Festive Songs for Christmas, no. 3. Shakespeare's Songs, no. 4 The Nutbrown Maid, no. 5. More Ancient Carols, no. 6. A Love's Complaint & The Phoenix and Turtle. Nos. one & two are the second edition; nos. 3-6 are the first edition. This matches the two copies at The British Library and the copy at Oxford. OCLC does not record other complete sets. Katherine Adams bound individual parts. The Shakespeare Head Press was founded in 1904 by A. H. Bullen, to print the works of Shakespeare. The first Booklet appeared at Christmas 1905, with a price of six pence. 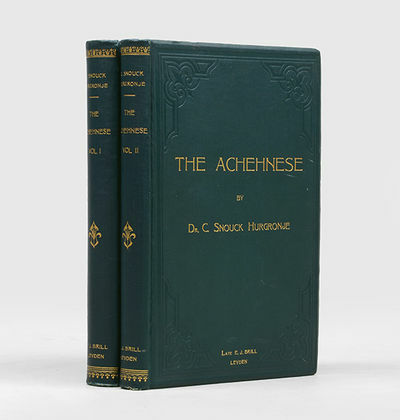 Chelsea: Ashendene Press, (1906). Small quarto. 161pp. One of 100 copies. Printed in red and black with initials by Eric Gill. This is the first book by the Ashendene Press with marginal notes printed in red. Featuring a designer binding by Franklin Mowery of black morocco blind-tooled with an intersecting and slightly shifting pattern of deep rules. The composition evokes a distant horizon, or perhaps the slowly shifting waters of the sea surrounding Sir Thomas More's imagined island. The abstract design is capped by the title, formed from burgundy morocco onlays shaped in Uncial letterforms. Binder's initials and date gilt-stamped to rear turn-in. Soft black suede doublures complete the design. Mowery is Head of Conservation at the Folger Shakespeare Library and has maintained a private practice as a designer bookbinder and conservator for more than thirty years. Bookplate of Jan van der Marck. (Tomkinson, p. 6). PLAYTIME IN PUSSYLAND. Father Tuck's Wonderland series. pages, including pastedown covers. Illustrated with 4 full-page coloured illustrations; other illustrations in black & white & blue. Full colour pictorial stiff covers. Oblong: 22 x 27 cm. 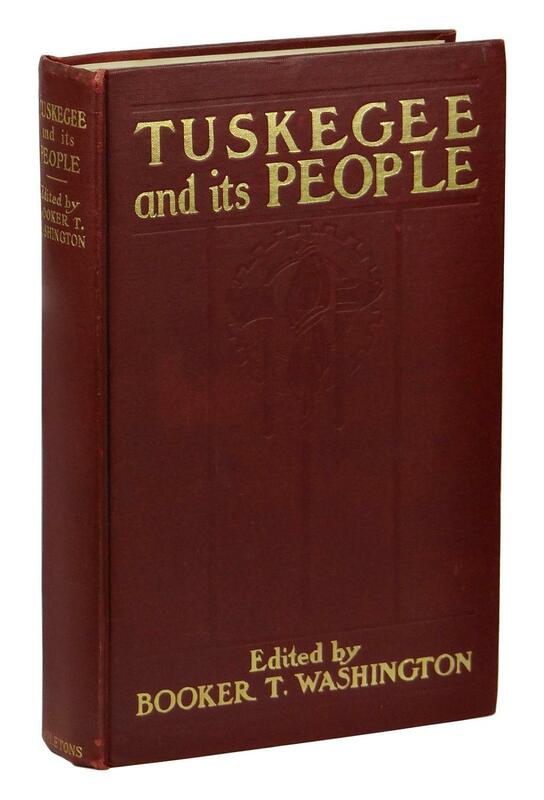 Spine expertly repaired; occasional marking; else a very good copy of a very scarce title. The illustrations, include cricket, and tennis. L'ERMITAGE Revue Artistique et Littéraire (subtitle varies: ...Revue mensuelle illustrée d'art et de littérature; ...Revue mensuelle de littérature et d'art). Année 1-17 (all publ.) Paris, May1890-1906. Collection of 11 complete years and 5 incomplete years lacking a total of 13 issues (detail below). Partly bound in 12 vols. contemp. hcalf, 2 vols contemp. hcloth and the remaining issues unbound in the original wrappers; 8vo and small 8 vo. With numerous orig. hors-texts and Index 1890/1902. Nice collection of this important Symbolist review, one of the richest sources for the literary and artistic life of the 90's in Europe, founded and directed by Henri Mazel (from vol. 7 directed by Edouard Ducoté). The impressive list of contributors includes o.a: André Gide, Stuart Merril, Francis Jammes, Paul Fort, Tristan Klingsor, Paul Claudel, Jean de Gourmont, Jean Moréas, Émile Verhaeren, Léon Bocquet, Albert Vidal, Henry Ghéon, Rémy de Gourmont, etc., etc. In years 1897-1899 (=Années 8-10), publ. as: Série Illustrée (LUXE), we find hors-texte ills. (lithographs, woodcuts & reproductions, several portraits of Symbolists) in each issue by: Paul Audra, Emile Barau, William Bradley, Lucien Alphonse-Daudet, Charles Doudelet, Edward Munch, Paul Ranson, A. Rassenfosse, Théo v. Rysselberghe, Toulouse-Lautrec (Portrait de femme), Jean Veber, Paul Berthon, Charles Guérin, Andre des Gachons a.o. Only one of these (a lithograph by M.Denis in Year 8, is missing). The following issues are lacking: Yr.1 nos.1,5,6,; Yr.2 no 9; Yr.3 no 7,9; Yr.6 no 7;Yr.7 nos.1,2,4,5,10,12 . In spite of these shortcomings a fine collection of a very rare periodical. Il Brasile e gli italiani. Pubblicazione del 'Fanfulla'. R. Bemporad & figlio, 1906. In 4, pp. 1187. Rilegat. coeva m. tela, tassello e oro. Testatine, finalini e capilettera. Testo su due colonne. Numerose illustrazioni n. testo. Lievi brunit. alla cerniera post. PETROL PETER. 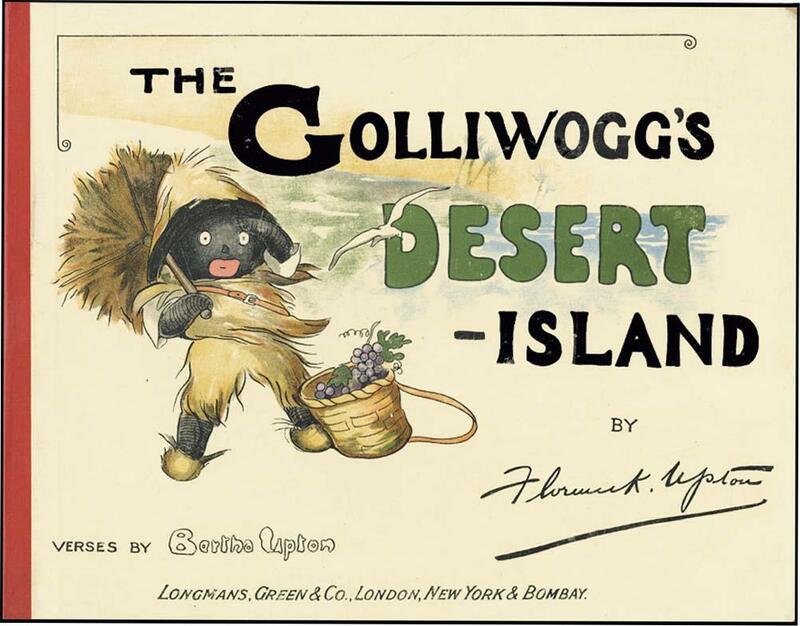 Illustrated by A. Wallis Mills. First edition. 24 leaves printed on rectos only. 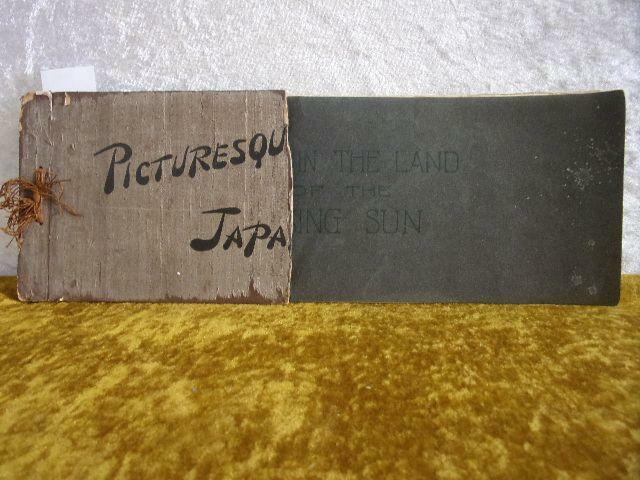 Original cloth-backed pictorial paper-covered boards. 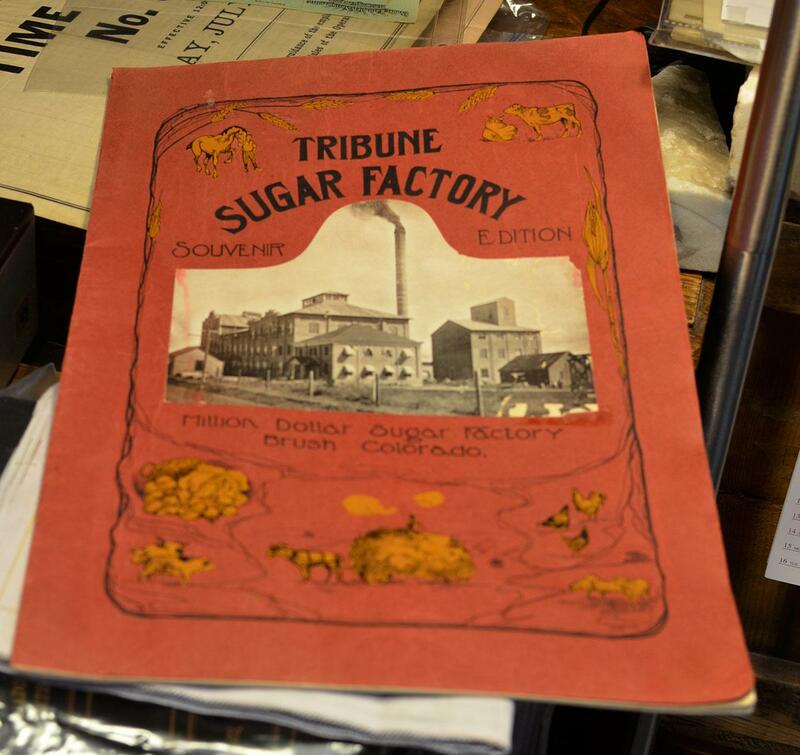 Original pictorial dust-wrapper. Slight wear at head of spine; wrapper torn and worn; else a very good copy of a rare and early motoring imitation of Struwwelpeter - exceptionally rare in the original dust-wrapper. Baumgartner Vol. I page 50. STEVENSON, Robert Louis (BIGELOW, Charles Curtis; SCOTT, Temple). The Works of Robert Louis Stevenson. Including New Arabian Nights, The Black Arrow, The Dynamiters, The Master of Ballantrae, Travels with a Donkey, Dr. Jekyll and Mr. Hyde, etc. New York: The Davos Press, 1906. Edition de Luxe, Published by Subscribers only, Limited to 1000 sets, this set number 184. 10 volumes; 8vo. Finely bound in recent dark green half morocco with gilt titles and gilt raised bands to spines, green cloth boards, top edges gilt others untrimmed. Frontispiece illustration to each volume. A fine set. Stratford-on-Avon: Shakespeare Head Press, 1904-1906. Ten quarto volumes. 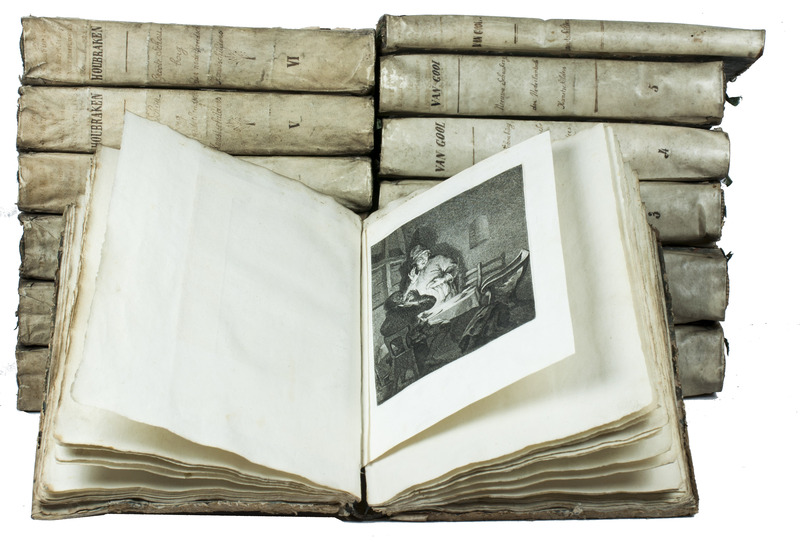 This set is one of only twelve printed on pure vellum with a frontispiece illustration in each volume. It represents a monumental undertaking, which took four years to complete and consumed about 250 sheets for each of the twelve copies printed on vellum. The Shakespeare Head Press was founded by A. H. Bullen, who had the idea of printing the complete works of Shakespeare at Stratford-on-Avon as the result of a dream in which he was presented with a set of Shakespeare's works while visiting the town. This is the first edition of Shakespeare to have been published in Stratford and the first major publication of the Press. Although other Shakespeare Head Press sets printed on vellum regularly appear on the market, the Shakespeare is very difficult to obtain: the last copy on vellum to come to auction was in 1960. Volumes I and II are lacking the silk fore-edge ties, spine lettering a trifle ru bbed on volume VI, else a fine copy in creamy full limp vellum stamped in gilt. (Tomkinson p. 229, Ransom p. 9). Ruins of San Francisco. Nob Hill in Foreground. From Lawrence Captive Airship. 1500 Feet Elevation. May 29, 1906. Chicago. Geo. R. Lawrence Co. 1906. Black and white photogravure 16 x 38 1/2 inches on sheet size 21 3/4 x 44 inches. Professionally repaired 5 inch tear to left edge (discoloration from previous adhesive tape, now removed, on verso; 2 1/2 inch tear entering image, no discoloration on image side), otherwise very good condition. A panoramic image of the ruins of San Francisco following the 1906 earthquake and fire, one of the photographs taken by George R. Lawrence using his astounding "captive airship" contraption, which consisted of "a kite train of up to 17 Conyne kites on a piano wire cable suspending a camera held by the specially designed stabilizing mechanism" (Simon Baker). At lower left is the copyright information with his company "Geo. R. Lawrence Co." with the place information of Chicago, New York, Washington, and San Francisco. This is not an actual photograph, but a vintage print Lawrence issued for sale at the time. THE STORY OF MISS MOPPET. First Edition. Second issue ['New York & London' on rear of wallet]. Panorama of text and colour illustrations extending to 2492 mm. Folding into original cloth wallet with shaped pastedown label. Ownership inscription on last blank verso of panorama; else a fine copy - rarely found in such pristine condition. Linder page 426. JAPAN / TAIWAN) Okishio, Takachika. Kobe, Japan. Fuku-In-Kwan. 1906. Folding map, printed color, 29 x 41 inches on sheet size 30 x 41 3/4 inches, folding as issued to 7 1/2 x 5 1/2 inches. Foxing on verso (not affecting map), single pinhole in each corner, a few lightly soiled spots and 1/8 inch separations at fold intersections, some soft creases from folding, overall good condition. Map is printed on two conjoined sheets. This striking map of Japan created under the direction of Takachika Okishio features Shikoku surrounded by 10 inset maps as follows: Chishima (Kurile Islands), Hokushu (Hokkaido), Ogasawara-Jima (Bonin Islands), Hachijo-Shima, Ioshima, Okinawa, Saki-Shima, Kyushu (Saikaido), Taiwan (Formosa), and Eastern Asia. Scale of main map 1:1250000. Features a Glossary and Explanation of Signs which include Towns or Railway Stations, Boundaries of Prefectures, Notable Places, Hot Springs, Water-falls, rapids, Volcanoes, Light-Houses, Gold, Silver, Coal-Oil, etc. The map of Taiwan measures 13 x 9 inches and is centrally featured. The Japanese Government Railway series of Travelers Maps of Japan appear to have been modeled after this design. Las casas de religiosos en Cataluña durante el primer tercio del siglo XIX/ Los religiosos en cataluña durante la primera mitad del siglo XIX. - B-Imp. Fco. J. Altés y Alabart, 1906-18. 28 cm. 2 vols. 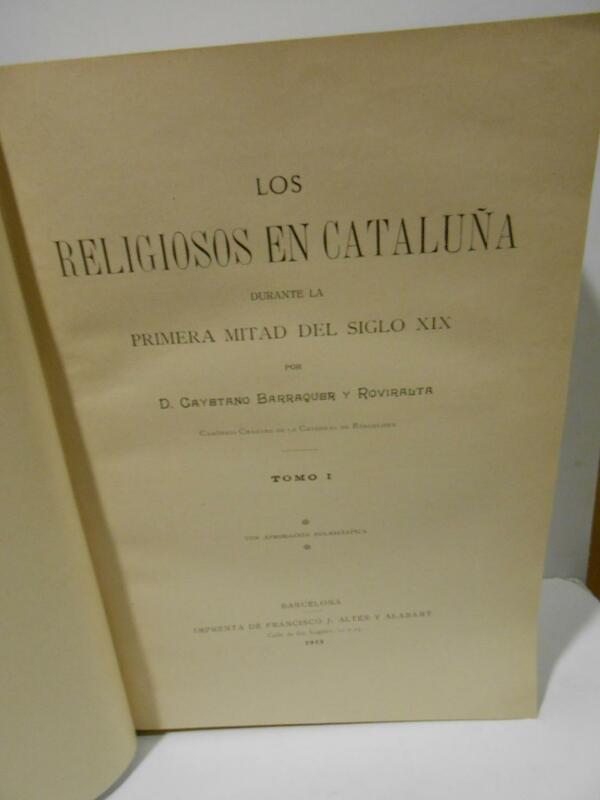 : (I) 4 h., 571 p. (II) 626 p. (Junto con:) Los religiosos en Cataluña durante la primera mitad del siglo XIX. 1915-18. (I) 2 h., 1289 p. (II) 866 p. (III) 717 p., 1 h. (IV) 789 p., 3 h. Todos los vols. con texto a dos columnas, profus. ilustr. con fotografías y lám. en fototipia, en y fuera del texto. Enc. en tela reciente, tejuelo, conservan las cubiertas originales. (10562-COL). RELIGIÓN. Eigenh. Widmung mit Namenszug in: Christian Morgenstern: Melancholie. Neue Gedichte. Berlin, Bruno Cassirer, 1906. 1906. (4), 84, (8) SS. Marmorierter Pappband mit eingebundenem OUmschlag und Rückenschildchen. 8vo. "Gottfried Benn / schenkt sich dies Buch Weihnachten 1906". - Innendeckel mit montiertem Exlibris des Pianisten, Komponisten und Musikpädagogen Gottfried Galston. - A rare AMQS from the important Italian concert pianist, teacher, and author of etudes, penned in the last year of his life. On a postcard bearing his portrait, Cesi has penned the beginning of one of his demanding piano studies, marked Presto, complete with fingerings and expressive marks. 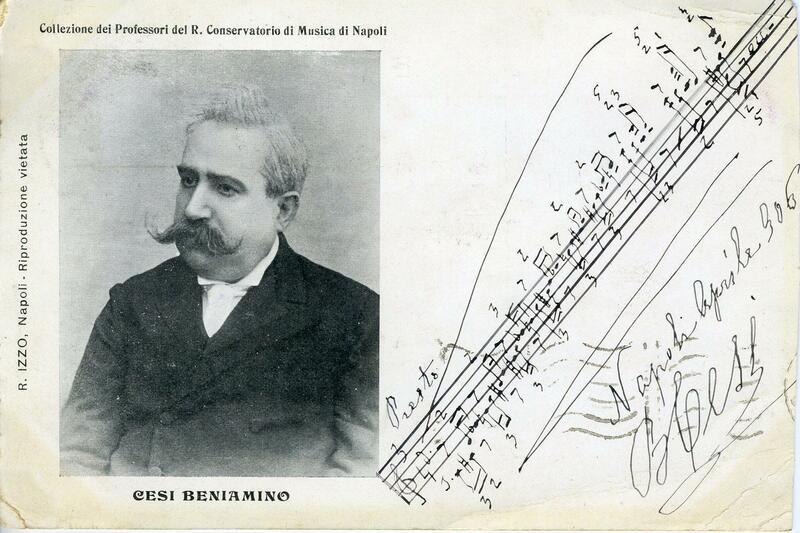 He has signed and dated in rather shaky writing: Naples, April 1906. On the verso, the postcard is addressed to the Argentinian collector Ramona Imaz Otaño. In fine condition. 5.5 x 3.5 inches (14.2 x 9.4 cm).Born in Naples, Cesi began his studies with his father, and later with Luigi Albanesi. He was heard by Sigismund Thalberg, who was so impressed with him that he made him one of his favourite pupils. He began his career as a concert performer in 1862 and quickly gained a reputation in Italy. At the age of 20 he won a competition to gain the position of piano professor at the Royal Conservatorio of San Pietro a Majella in Naples. When Anton Rubinstein was appointed director of the Petrograd Conservatory, he invited Cesi to direct the pianoforte schools there. Cesi accepted the appointment in 1885, remaining until 1891, when he was forced to return to Italy owing to a paralysis which had set in. This, however, left his intellect unimpaired and still gave him the use of his right hand, and in 1894 he became a teacher in the Conservatory at Palermo, and after a few years there he was able to return to Naples Conservatory, where he remained in charge of a chamber-music class until his death in 1907. His educational writings (Method for Pianoforte) had considerable importance, and he wrote many volumes of revision of piano music. Among his notable pupils were Giuseppe Martucci, Alessandro Longo, Michele Esposito, Samuel Maykapar, and Leopoldo Mugnone. London: Macmillan & Co, 1906. First Edition. Hard Cover. Octavo. 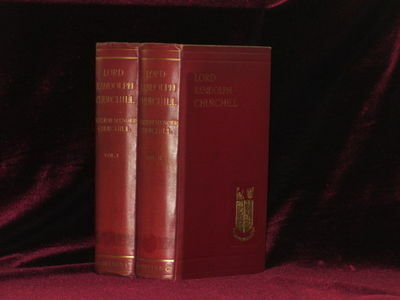 In two volumes, 564, 531pp., bound in original burgundy cloth with Churchill family crest stamped in gilt on the front panel of both volumes, illustrated in color and in black & white. Only a trace of wear at extremities, Bookplate of Colston's Girl's School, Bristol by bequest of of Charles Julious Ryland on front pastedowns, library shelf sticker skillfully removed from lower spines leaving a trace of discoloration, slight fading to spines and front edge of volume II. Internally very clean, with no previous owner's names or stamps. Firs edition of Sir Winston Churchill's acclaimed biography of his father. The Achehnese. Translated by the late A. W. S. O'Sullivan. With an index by R. J. Wilkinson.